It had been almost two years since I last visited Rocha da Pena, a spectacular escarpment west of Salir. Changes for the better were immediately obvious. A barrier to prevent vehicles entering the trail had been erected and designated parking areas had been provided. The trail had been upgraded with much more way marking, including cairns, and additional information boards. As ever, the English translation was poor. Why can’t a native speaker be asked to proof read translations before an expensive noticeboard is erected? After noting that Blue Rock Thrushes were affluent, I moved on. This delightful 5km trail is now more popular than ever and I’m very pleased to say that it was litter-free. Everyone I met on this beautiful February morning had a smile and was clearly enjoying the hike. The only blot was an English-speaking couple with an armful of Paperwhite Narcissi that they had dug up for their garden. Alright there were masses of those white narcissi but suppose they had found the rare miniature daffodils? When I first visited this sítio classificado twenty years ago there were used shotgun cartridges everywhere but today there is no hunting. But this has led to a surge in the population of Wild Boar and evidence of their rooting was obvious in many places on the plateau. 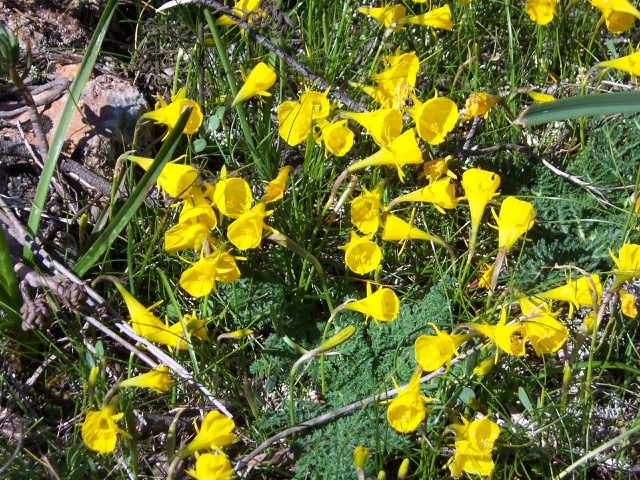 Rocha da Pena is an important botanical site for a great variety of wildflowers including orchids, Brotero’s Peony, Hoop Petticoat Daffodils and the rare Narcissus calcicola. 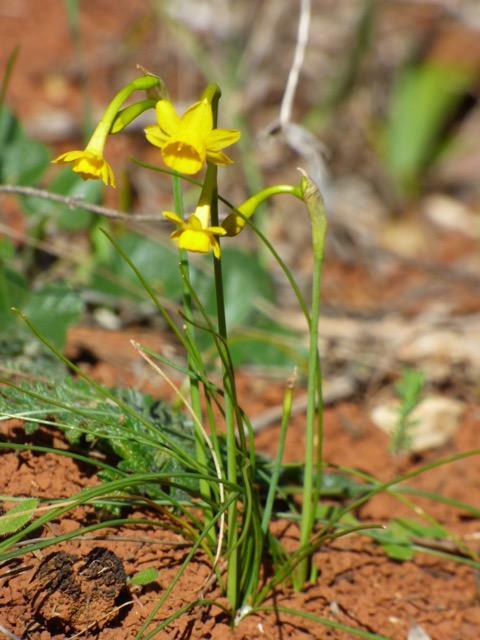 I was perhaps too early for orchids and peonies, although I have found them there in late January, but I would have expected to have seen the two species of yellow narcissi easily. I did find them but with difficulty. 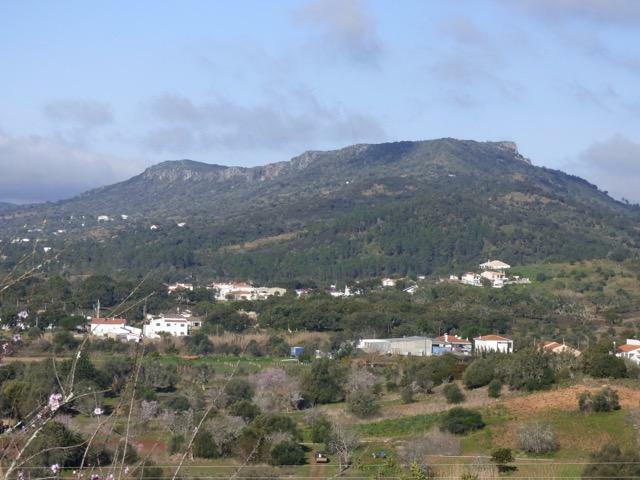 Once on the plateau it is well worth taking the side trail to the Miradoura Norte, which provides spectacular views of the remote valley beyond and the Buddhist temple on the distant Serra do Malhão. There is no longer a marked trail to the impressive cave Algar dos Mouros but in any event the entrance has been fenced off. The information boards and the free pamphlet, usually available at the friendly café, Bar das Grutas, at the start of the trail, provide an impressive bird list including breeding Bonelli’s Eagles and Eagle Owls. But, in truth, this is not a birdy walk. The commonest bird on the plateau, and often the only one seen well, is the ubiquitous Sardinian Warbler. Rarities do occur, especially in winter and during the migrations but do not expect to focus binoculars too often. The butterflies can be very good. 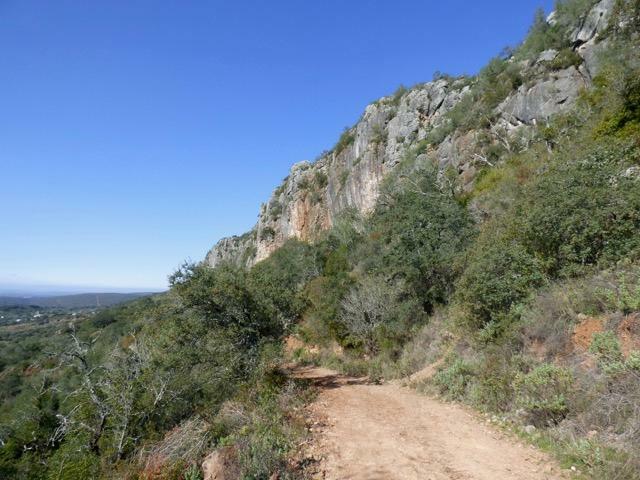 This is probably the best circular walk in the Algarve but it is not the easiest. If the side trails are included and the short diversion to the summit, Talefe 479m, the length is probably more like 7km. Fortunately the hard work comes at the beginning but even on the plateau the rocky parts are not that easy for the less ambulant. After the trail crosses the extraordinary Iron Age defensive wall it is less difficult. As the track drops off the plateau it passes through Penina, which is still very much a traditional village of the Algarvian serras. The final amble back to the start point passes impressively beneath Rocha da Pena. 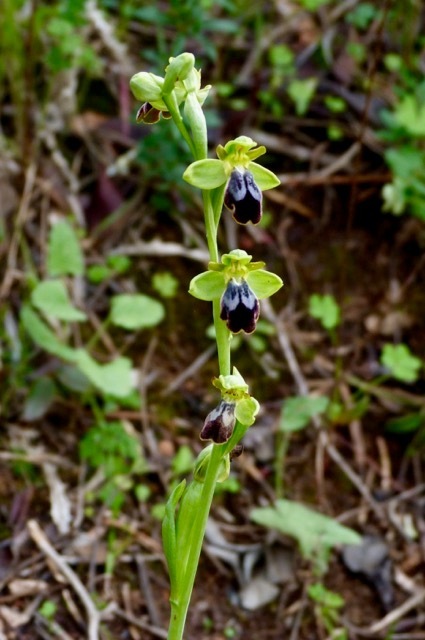 I was determined to find an orchid in flower, so I drove a few kilometres to another sítio classificado, Fonte da Benémola, and was pleased to see that the trail had also been upgraded. This is another important botanical site and right there by the car park was a lovely Sombre Bee Orchid. My first orchid of the year. And for a bonus, a rare Large Tortoiseshell butterfly, just emerged from hibernation, flew by.